I love to cook with fresh tomatoes whenever Jon isn't going to be home for dinner. Jon hates tomatoes and they are one of my favorite things to eat! Once again I was in the mood to throw my recipes aside and create something new. Today my inspiration came from the miniature fresh mozzarella balls I bought today. They are tiny, like little pearls. I cooked some pasta. In the meantime, I sauteed 2 cloves of garlic in oil, added a few shakes of red pepper flakes, and then added a splash of white wine (specifically, RH Phillips Toasted Head Chardonnay). I let that simmer for a few minutes and then added a little less than 1/2 of a can of chicken broth (vegetable broth for vegetarians). After a few minutes I added 1 chopped vine-ripened tomato and let that simmer on low. When the pasta was done, I added it to my tomato-broth mixture and threw in 2 handfuls of fresh baby spinach. As the spinach started to slightly wilt, I finished the dish off with a tiny bit of dried parsley and dried basil, some freshly grated pecorino-romano cheese, a tiny bit of salt, and topped it with capers and the mini mozzarella balls. For such a simple and quick meal, the results were incredible. There were so many different flavors, yet they all blended very well. 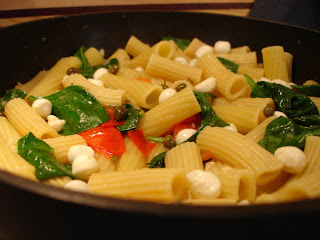 This dish was a really nice, light, fresh pasta dish for a warm evening! I love those mini mozz balls! Great job! I'll have to look for those next time I got to a speciality cheese shop. P.S. I LOVE fresh tomato...d.h. does not so I know how you feel.